One of my very best girlfriends from college has a personal blog where she includes little ramblings of her life, a picture every now and then or a sweet thought. Kristine is my kindred spirit as far as communication goes. Both of us mildly moody, vulnerable talkers, easy tears - she's the best kind of friend to have when you need to process life with someone. She posted a rhetorical question asking "what will be the tone of your life?". A melody, as she calls it, made up of words, conversations and attitudes. I tried to think of mine, and came up with a list of a few things I wanted it to be, but couldn't settle on one word that would qualify as my aspired tone. You don't often think of yourself in the form of complimentary adjectives, but this question isn't about patting yourself on the back, as it is setting a thesis for the rest of your story. Are you ready for my utterly general response? Loveliness. To be enjoyable, delightful, gracious, to inspire and be full of love. I'm excited by sending notes, nurturing, doing favors, feeding people, listening, and want to do more of it. Love. Maybe it's too big or too vague of a word to throw out as one's tone, but it makes sense to me right now. As we stayed up late last night talking about this, I asked Hugh what he thought my tone would be, and he named it... and when I explained how I thought his tone was 'intention', complimenting the purpose with which he does things, he said I was close, "I want my tone to be, BE AWESOME. It's the same as intention, but in Hugh language." Can't say I'm surprised. Always dependable to lighten the mood. May that encourage you to give this some thought. It doesn't have to be a heavy question, you can just want to be awesome, but it's important to boil the big things down every now and then. It may be an endless endeavor, but a little perspective is always welcome. This is hardly a recipe, but I wanted to give some ballpark measurements and hints for those who want them. 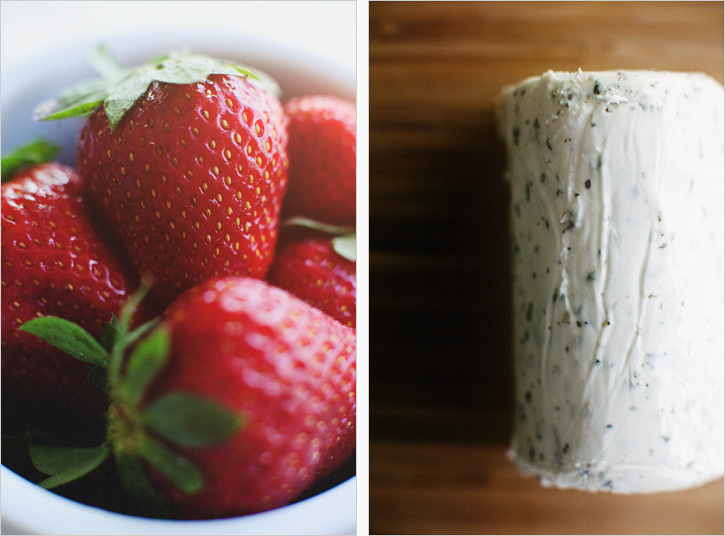 Pick up the most fragrant basket of strawberries, deep red right up to the stem. Then add sauteed leeks with their subtle onion flavor, all held together by the creamy tartness from the goat cheese. It's a ten minute snack of pure LOVELINESS. 1. 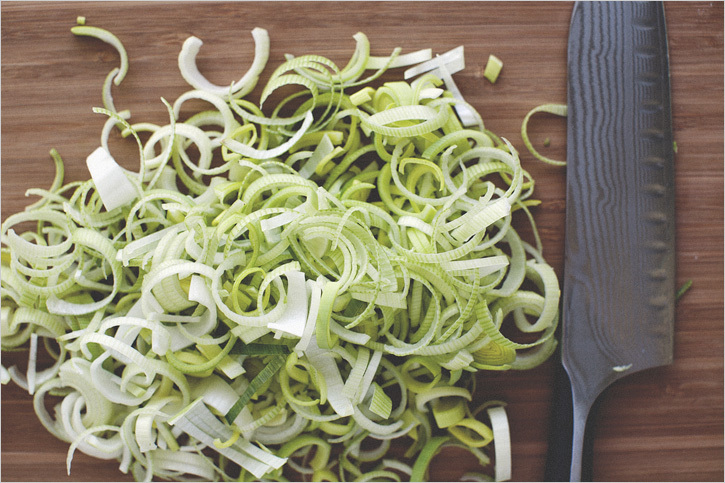 Remove the tough, dark green top of the leek, to use only the white and light green parts. Slice the leek in half length wise and clean out any dirt. Slice thin. 2. Heat 1 tsp of the oil in a large pan and saute the leeks with a pinch of salt for about 10 minutes until softened and just browning in parts. Transfer to a bowl. 3. Over medium high heat, warm the remaining tsp. of oil and lay down one of the tortillas. Use your discretion as far as filling amounts. 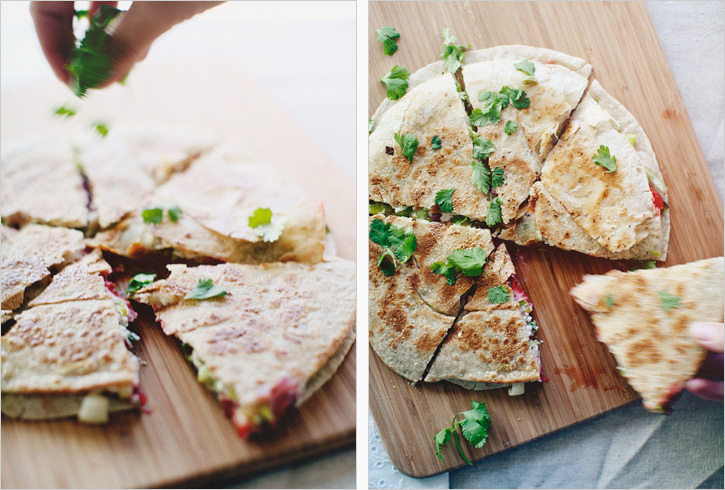 All across the tortilla, sprinkle half of both cheeses, desired amount of the sauteed leeks, strawberries, a sprinkle of pepper and the rest of the cheese. Cover with the other tortilla and cook about 2 minutes until the bottom is browned, flip the quesadilla and cook 2-3 minutes on the other side. Slice and sprinkle some cilantro if you'd like. P.S. One of our advertisers, Maggie of Eat Boutique, is offering $10 off to Sprouted Kitchen readers for Mothers Day gift boxes! 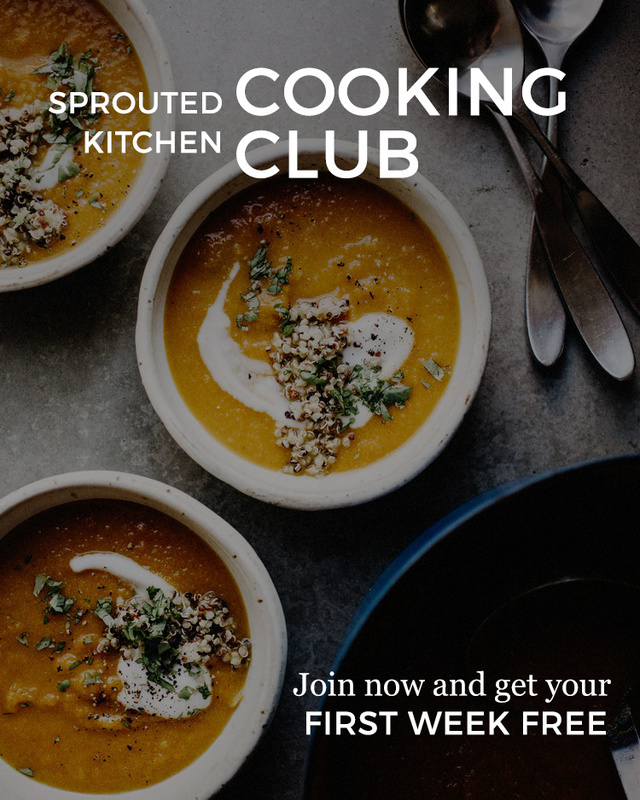 Click to her page on the sidebar and use the code word SPROUT !